Anne, Osa and I were cruising along the Palm Beach Lake Trail when Osa shouted “Stopping” and locked down her brakes. Osa spent years crewing on yachts, so she has a keen eye for things that float. 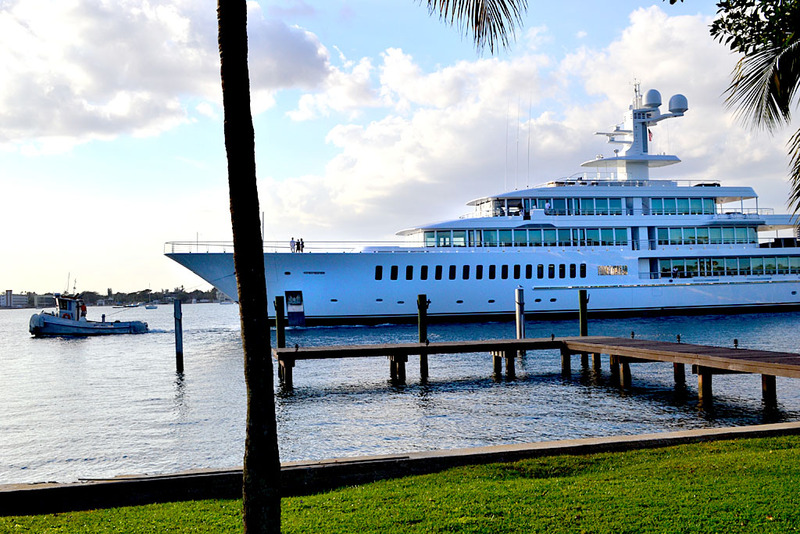 She had spotted a yacht that was so big that it had a tug in the front pulling it and another smaller boat riding drag at the stern because it was too large to maneuver in the Intracoastal Waterway. Click on the photos to make them larger. Osa estimated that it was 250 feet long. While we were gawking, a guy rolled up and started doing some searches on his smartphone. “It’s 88 meters long,” he said. “That’s about 270 feet (288.713911, to be exact). Mark Cuban owns it. 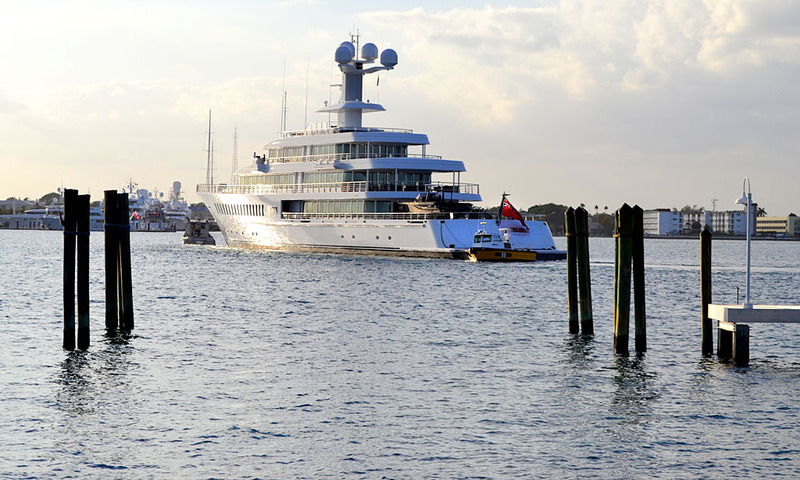 He and Mark Ellison of Oracle fame bought twin yachts from the Dutch luxury yacht company, Feadship, at the same time.” Ain’t the Internet wonderful? The sister to this ship is a downsized version of Mark Ellison’s previous yacht, the Associated Press reported it was 452 feet long, was five stories tall, had 82 rooms, “a wine cellar the size of most beach bungalows, a dozen yacht-length tenders, and a generator capable of providing enough electricity for a small town in Idaho or Maine… Final cost: $377 million.” He got rid of the larger yacht because he didn’t travel with that many people and it was hard to find mooring for something that big. How do you afford a yacht like this? In 1995, Cuban and fellow Indiana University alumnus Todd Wagner started Audionet, combining their mutual interest in college basketball and webcasting. With a single server and an ISDN line, Audionet became Broadcast.com in 1998. By 1999, Broadcast.com had grown to 330 employees and $13.5 million in revenue for the second quarter.In 1999, during the dot com boom, Broadcast.com was acquired by Yahoo! for $5.9 billion in Yahoo! stock. After the sale, Cuban diversified his wealth to avoid exposure to a market crash. As of 2011, Cuban is No.459 on Forbes’ “World’s Richest People” list, with a net worth of $2.5 billion. The Guinness Book of Records credits Cuban with the “largest single e-commerce transaction,” after paying $40 million for his Gulfstream V jet in October 1999. What was that strike thing all about? I’m sure some of you were wondering what that strike thing was all about yesterday. Thousands of websites, some as large as Wikipedia, others as small as my two blogs, went dark for 24 hours to protest two bills that are making their way through Congress. They are ostensibly to stop Internet piracy, but have the potential of crippling the Internet as we know it today. I’ve experienced the chilling effect of what’s already on the books. I posted a video of a night lightning with a public domain audio of Beethoven’s Fifth playing in the background. YouTube sent me a notice that they had removed the audio because of copyright concerns. It took 24 hours to get it back up after I provided evidence that the performance was in the public domain. Guilty until proven innocent. Under the new laws, my whole site could have been taken down and I could have been subject to fines and jail had I been found to have been using copyrighted material. I have a video on my bike blog where I’m passing a slower rider. You can hear my MP3 player in the background. Conceivably, that could be a violation of the law. If you don’t think they’ll fool with “the little guy,” consider this: we didn’t invade Russia nor China; we went after Granada.